CRAGHOPPERS Womens Madigan Long Line Jacket in Peacock has a zip off hood for extra protection and has five pockets to store your hiking essentials. It also has an inner and outer storm flap for extra protection and a brushed chin guard and inner collar. 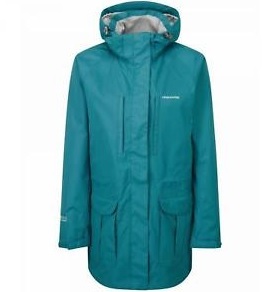 The extended length of this jackets offers generous protection against the elements.